In a thick bottomed pan, add 3 tsp of coconut oil. Add shallots and onions to it and sauté well till the color changes. Now add ginger, green chilies, tomato. Sauté again. Add dry curry powders (chili, coriander, turmeric, pepper, garam masala), salt, required amount of water and prawns. Mix well. Close the lid and cook well. 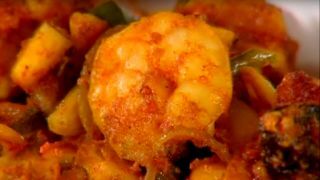 Do not cook it too much otherwise prawns will get very hard. When the gravy thickens and the oil floats on the top, add curry leaves and coriander leaves. Mix well and serve.